US Interest Rates - Should You "Fret" Over the New Fed Chair's Possible Actions? Is new Fed Chair Jerome Powell a hawk -- meaning, will he aggressively raise rates to curb inflation? Investors are starting to doubt whether they can count on the protective embrace of an accommodative U.S. central bank when markets go haywire. Of course, "accommodative" means leaving interest rates low, or raising them slowly and a little at a time. This is "accommodative" to the stock market because low rates are supposed to motivate investors to seek higher returns in the stock market. On the other hand, higher rates would provide competition for stocks. Here's something to keep in mind, before we go on: EWI's studies show no consistent relationship between the trend in rates and the stock market. Even so, this belief remains widespread. Getting back to whether Powell will be aggressive with raising rates, our research posits that wondering about the new Fed chair's possible future actions is based on a false premise. You see, the evidence shows that the Fed does not act; it reacts. It reacts to the bond market. In other words, the bond market leads the way on rates, not the Fed. No one monitoring the Fed's decisions can predict when T-bill rates will change, but anyone monitoring the T-bill rate can predict with fair accuracy when the Fed will change its funds rate. 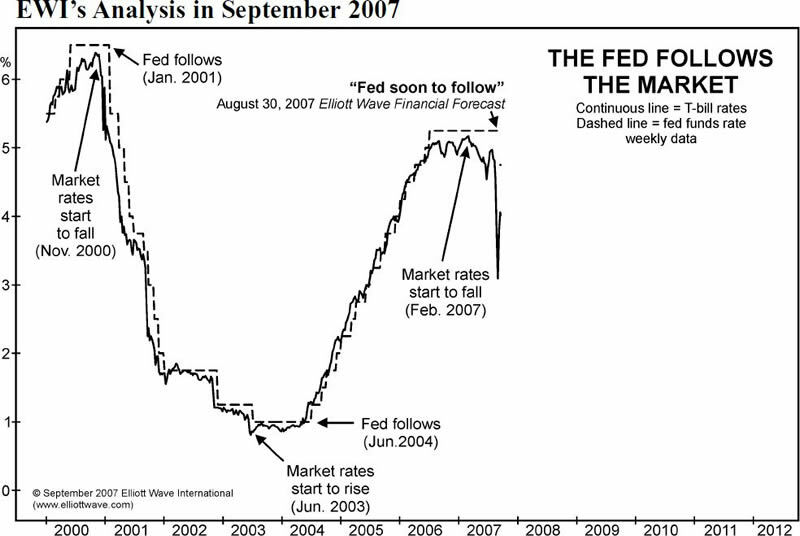 The Elliott Wave Financial Forecast demonstrated this ability in September 2007 by predicting that the Fed was about to lower its federal funds rate dramatically. As you can see, the Fed's benchmark rate followed the T-bills rate lower. This pattern maintained even during the dramatic period of double-digit rates in the late 1970s and early 1980s.... T-bill rates peaked four times in 1980-1982. 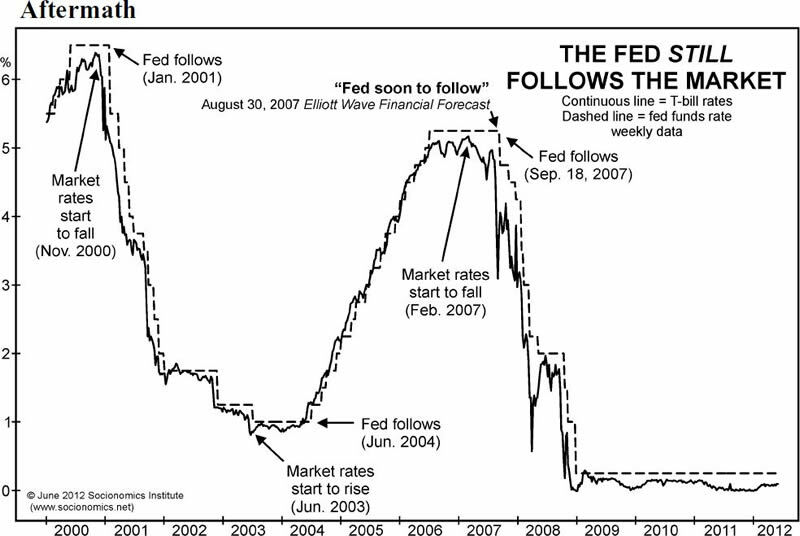 Each of those peaks occurred a month or more before subsequent and reactive peaks in the federal funds rate. The Fed's rate also lags at bottoms, [such as] the lows of 1980, 1981 and 1982-3. So, regarding interest rates, it's best to monitor the bond market, not the Fed. Financial markets are governed by investory psychology, which expresses itself in repetitive price patterns at all degrees of trend. We call them Elliott wave patterns. Following these patterns in the bond markets -- something us here at EWI do regularly and share our findings with subscribers -- can help you anticipate what's next for interest rates. This article was syndicated by Elliott Wave International and was originally published under the headline Should You "Fret" Over the New Fed Chair's Possible Actions?. EWI is the world's largest market forecasting firm. Its staff of full-time analysts led by Chartered Market Technician Robert Prechter provides 24-hour-a-day market analysis to institutional and private investors around the world.